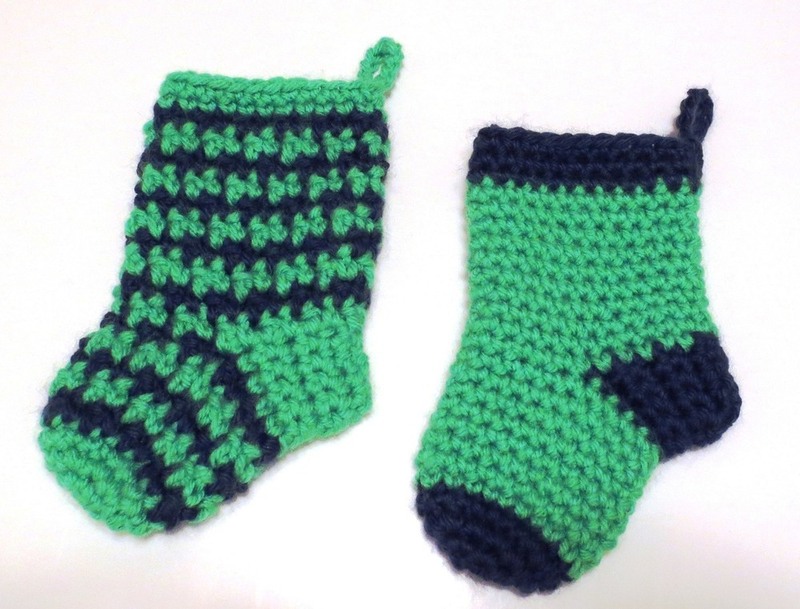 Here are a few Seahawks inspired mini Christmas stockings for the troops. The one on the left is done in Houndstooth stitch that I just learned to do this past week. It is a fun and easy stitch. I plan to do a blanket and some hats now that I know how to do the stitch pattern. I'll be helping. Is there a pattern for sewing the mini stockings available? My friend might help if so. I like that Houndstooth stitch. I will need to look that up. Maybe you have a link "how to"?. Cindy has instructions here her sewn denim stockings. I have bookmarked these instructions thinking maybe I would try it some day. It has a template that you should be able to adjust so the stocking turns out to be about 6 inches long from tip of the toe to the top. Thank you! I'll pas this information along to my friend who doesn't crochet but does sew and see if she'd like to participate. 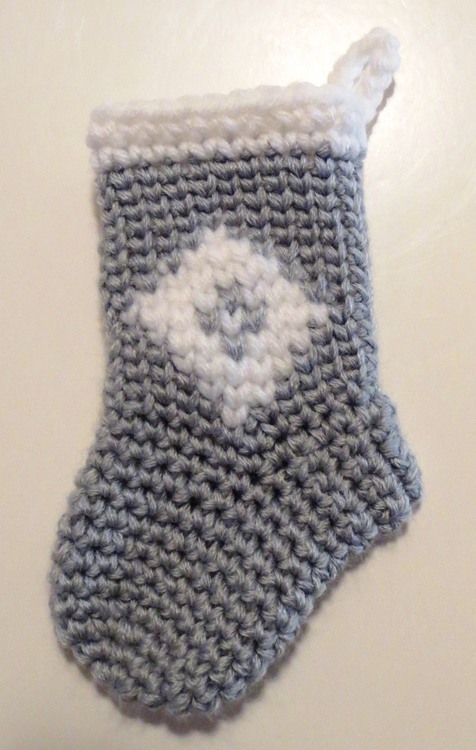 Any pattern is okay and make the stockings about 6 inches long. All colors and styles are accepted. Thank you so much for your offer. I don't have my pattern written up yet but work even on about 20 sts for the toe and then 24 sts for the leg. Work Sc, Dc around for the Houndstooth pattern. I do plan to get a free pattern written up soon. Brenda how many stockings did you made already this year?. Must be a lot! Wonderful batch of stockings! Thank you so much. 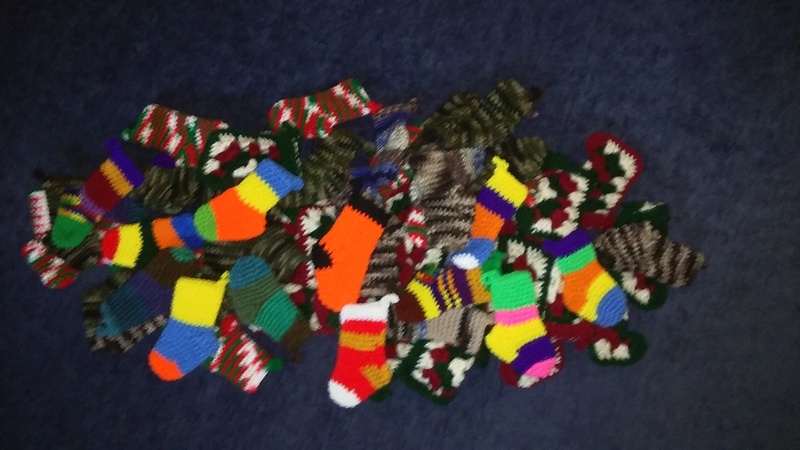 Here are a few more stockings I got crocheted recently for the troops. I have made and mailed 215. I love making them. OMG! that is a lot!! My goodness you probably will cover the whole army by the end of the year. Now, I feel really embarrass :(. WOW! What an amazing number of stockings you have already made this year. I mailed off 25 mini Christmas stockings I crocheted along with 9 stockings sent to me by Claudia over at Ravelry after our stocking along. We had over 250+ stockings made for the troops during the stocking along. Our deadline this year is November 1. So please join us in this last push for stockings for the 2017 Christmas drive for the Warmth for Warriors. Just wanted to provide an update on our last count at the end of September from the Warmth for Warriors office. The count total was 1615 in Christmas stockings received. Keep up the great work and just remember to send all stockings for delivery by November 1, 2017. Awesome count and I know the number has gone up. I am anxious to get started on a batch for next year but must force myself to stay focused on getting my Christmas presents for family snd friends taken care of. Brenda probably crocheted almost all of them. Just kidding. But I know she did made a LOT of them. I messed up this year, did not send any!:(. I will try to do better next year. No Krys I have seen some numbers and my contribution is not anywhere near the total. I do hope you are able to help out next year. Everyone's contributions really add up. Hello to everyone that has supported us over the years. Here is a count for 2017 and when we first begun this venture. Received in ‘17 for Hats: 3,746 and mailed 1,859 and the total we have mailed since beginning is 45,951. Stockings were 2,819 received in ‘17 with 2,800 stuffed and mailed and 9,373 since beginning. That is a lot of knitting/crocheting and so many of you donating your time and money to do this. Without ALL of you our mission wouldn’t and couldn’t be accomplished. A HUGE THANK YOU TO EACH AND EVERYONE OF YOU! It is such a gratifying project and we THANK OUR TROOPS for their service! Be safe and return home soon! Wow 2,819 stocking received in 2017! Thank you everyone here at Crochetville that participated in this year's drive. What awesome numbers. It just shows what can be done if we all do a little bit. Lets do it again in 2018. Yes it is so exciting to see what we have accomplished this past year for the troops. We will be back in 2018 with a new thread and drive for mini Christmas stockings.